Get Crazy with Cricket Games! Strategy Games all the way! Use arrow keys to direct the falling blocks and fit them into each other.Tetris will always be listed as one of our favourite games. The furious punching of the arrow keys to fit the blocks well enough to form a perfect line makes the game a hit! 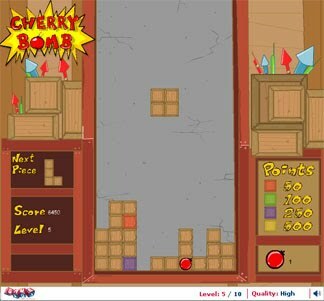 Cherry Bomb is nothing but the classic Tetris with a twist. Blocks with cherry-bombs, firecrackers and rockets make this game a riot! Play it just like you’d play the classic, but have a cracker of a time. Use arrow keys to direct the falling blocks and fit them into each other.